WoodWinds Bridal Show Talk on WTNH-TV's "CT Style"
held his WKCI radio event at WoodWinds. We wish him a long, successful career! 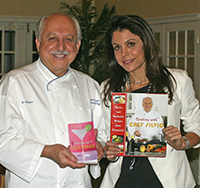 TV personality and author, Bethenny Frankel, held her book-signing party at WoodWinds recently. We had a great time; she's a lovely and smart businesswoman! We swapped books because I wanted to try some of her cocktail recipes and she thought my sauce was "amazing" - now, we're both happy! Food Network's Celebrity Chef, Maneet Chauhan and Chef Silvio teamed up to help raise money for a very worthy cause. Chef Silvio on the set for his new series of "how to" videos on eHow.com and livestrong.com. 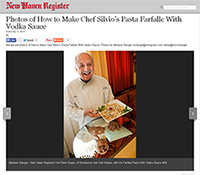 Chef Silvio was very honored when ehow.com asked him to be one of their expert Chefs featured on their many sites in the category of Italian, Mediterranean Cuisine. He is such a hit, that they've asked him back to do many more! Cafe Allegre supports the community by donating food to the Madison Exchange Club. 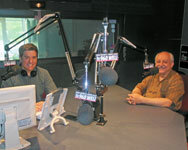 Chef Silvio was on WELI last week with radio host Jim Masters, who is also the national host for PBS, Close-UP TV News & Talk Radio, Connecticut Perspective TV on ABC, WTNH TV. They always have a great time together! 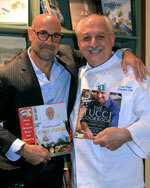 The "Tucci Cookbook" Meets "Cooking with Chef Silvio"! Academy & Golden Globes nominated actor Stanley Tucci discussed food, cookbooks and regions of Italy where Stanley had just returned from with his lovely bride Felicity Blunt. Chef Silvio is featured on Adventure Tours! 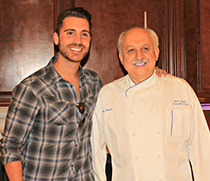 Hear his story and watch him cook a savory dish from his new cookbook! 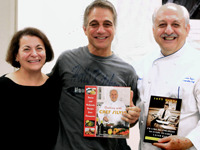 Chef Silvio & Vittoria exchanged books and stories with Tony Danza. They had lots of laughs and Tony was thrilled to have Silvio's Braciole with Rigatoni! 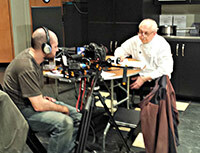 ABC's WTNH-TV Hosts Sonia Baghdady and Darren Kramer watch Chef Silvio Suppa make Steak Pizzaiola. 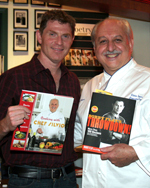 Bobby Flay and Chef Silvio swap their cookbooks! Flay was in town promoting his new cookbook "Throw Down" and asked Chef Silvio if he could have a copy of his book "Cooking with Chef Silvio" and the two exchanged recipes. Bobby is Food-TV's star with shows like "Throw Down with Bobby Flay", "Iron Chef America" and "Grill It" along with several cookbooks and restaurants across the nation. Learn to make Bruchetta! Easy & Cost Effective! Rachel Ray was in town promoting her cookbook "Look & Cook" and met up with Chef Silvio. 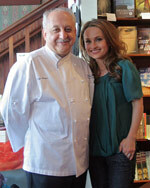 shared some "Italian chef-talk" time recently while Giada was in town current cookbook, Giada's Kitchen: New Italian Favorites. Giada, the granddaughter of famed film producer Dino De Laurentiis, and star of Food Networks' "Everyday Italian," is also an author of several best-selling books. 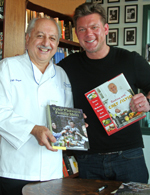 Food TV star, Tyler Florence (Tyler's Ultimate) exchanged cookbooks with Chef Silvio Suppa, owner of Café Allegre in Madison, CT, as they were both promoting their new cookbooks at R.J. Julia's in Madison. Silvio and Vittoria with TV's Uber-chef Lidia Bastianich and host of "Lidia"s Italy"
They all share a similar background and had a great time speaking with her in their native tongues too! with the owners of Cafe Allegre, Chef Silvio Suppa and his wife Vittoria, @ R.J. Julia's Bookstore in Madison, CT. Flay was promoting his book "Grill It!" and after his book signing he went to the best place to dine...Cafe Allegre, of course! He dined on Penne Ala Vodka, Chicken with lemon sauce and drank Cantarutti Pinot Grigio. Flay graciously signed autographs as patrons of Cafe Allegre politely approached his table - not wanting to disturb him. stopped in for lunch recently on a recommendation by his manager and loved his meal so much he went into the kitchen and invited the Chef and his entire staff to the opening of his new "House of Blues" restaurant at Mohegan Sun Casino. 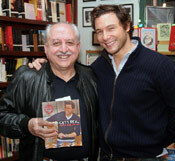 Rocco DiSpirito and Chef Silvio exchanged books recently while Rocco was in town promoting his new healthy-eating book. They had a lot to chat about as Rocco had just returned from Campania, Silvio's homeland, while writing his next book due out later next year. Oscar nominee and Golden Globe award winner, Tom Berenger, with Chef Silvio at WoodWinds attending his son's wedding! Only the best for Tom's son and that would be WoodWinds and Chef Silvio! Tom conversed in Italian with Silvio and did a great job: A man of many talents! They spoke about Emeril's cookbook "Emeril at the Grill" and he shared with Chef Silvio that his dad was instrumental in getting him hooked on grilling and his dad is still grilling today! Time to make room! 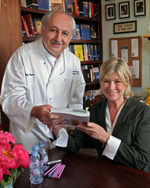 Martha Stewart was pleased to hear that Chef Silvio is coming out with his own cookbook, "Cooking with Chef Silvio: Stories and Authentic Recipes from Campania" and wished him well! 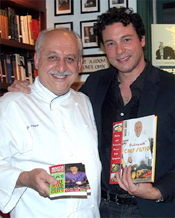 Chef Silvio with his new friend, Rocco DiSpirito. Rocco was in town recently promoting his new book "Rocco Gets Real" and had heard rave reviews from his friends about Cafe Allegre. Rocco and Silvio's family come from the same region in Italy. Maybe they're long lost cousins? CBS affiliate WFSB-TV invited Chef Silvio to be on their "Better Connecticut" program with hosts Scot Haney and Kara Sundlun. Chef Silvio made one of his favorite fall dishes, "Pumpkin Risotto." The Chef also surprised them with his homemade "Pumpkin Chips"! A great innovative crunchy topping complimenting his creamy mixture of Arborio Rice and sautèed pumpkin. When you're dining at Cafe Allegre ask the Chef about this dish and his delicious Pumpkin Chips!! 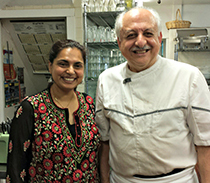 Sonia Baghdady with Chef Silvio. They joined in to help make a Suppa family favorite -Cannoli Cake! We heard that they fought over the crumbs after he left the building! Check out the easy and delicious recipe online.